One of the great things about belonging to a professional network is information sharing. What better way to learn of upcoming conferences, absorb key learnings from conference others have attended, hear about career opportunities and gain wisdom from the experience of so many others? AWLN wants to encourage its members to share information of this nature with their fellow members by sending emails to the group at AsianWomenLeaders@yahoogroups.com. We encourage member discussion regarding professional development and mentoring, and if there are topics you would like to see in upcoming newsletter or events, please email us at communications@awln.org. Teleconference: Respond to AWLN_RSVP@yahoo.com ASAP to receive Teleconference Info. Materials available on member site. RSVP: To AWLN_RSVP@yahoo.com RSVP as soon as possible as space is limited! The Essence of Meaning lies not in what you say, but how you say it. All communication is influenced by cultural, social and psychological elements that can either enhance or interfere with your Career Mobility. In this highly interactive workshop, you will learn what does and does not work in a variety of communication experiences that include effective partnering, meeting behavior, public speaking, opening pitch, and networking. Virginia Reed, Ph.D (ABD), is an internationally acclaimed expert on spoken and nonverbal communication. Her clientele has included Time Warner Sony, Citigroup, Starwood Hotels, N.Y.U Law School, Duke University, Brown, UCLA and several NY Hospitals. She is a senior Career Advancement Program advisor at JPMorgan Chase. Virginia is affiliated with Pratt University and is a master teacher of nonverbal communication theory. She has appeared several times on Fox News and Good Morning America on body Language, and has co-hosted radio programs on WMCA, WEVD and WBAI. Ms. Reed is the President of The Laban Institute of Movement Studies, an international research, educational and cultural organization that certifies participants at a Masters Degree level in the analysis of communication techniques and movement technologies. This event co-sponsored by Springboard and Paul, Hastings, Janofsky & Walker LLP. AWLN will host a Networking Meeting on 7/20 at 5pm - Location and info provided at the conference or by RSVP to AWLN_RSVP@yahoo.com. AWLN’s own Chair of Best Practices, Jane Hyun, will co-host the workshop “Mentoring Women of Color - What’s Different?” on July 20th at the conference. AWLN’s First Virtual Networking Session: Expand your network, Chat with us! In response to member requests for internet networking, AWLN will host virtual networking chats beginning in August. Join us for one of these sessions designed to help members expand their network by getting to know other members and the AWLN Board. Chats will be limited to 20 members per session, will last 1.5 hours and are for AWLN members only. RSVP and AWLN Membership is required to gain access information. Join AWLN to participate in this event and receive information on future AWLN events. 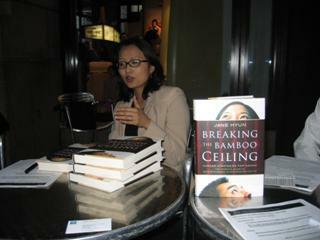 Jane Hyun, AWLN’s Chair of Best Practices, has written the first book of its kind that urges professionals of all levels to embrace their cultural differences, understand them, and seek to break this coined “bamboo ceiling.” The discussion that spurred that Wednesday at the Atrium of the Sony building at 590 Madison Avenue was enlightening and comforting. The book helped me to reinforce and acknowledge some of the feelings that I encountered at the workplace. What Breaking the Bamboo Ceiling has done for me was point out the apparently small things that matter but are not as intuitive for someone with my upbringing. Though I was born in the U.S., many of my life lessons were taught to me by my grandparents. We found that despite our country of upbringing (as ABC’s or immigrants), our distinct cultural values surfaced in the workplace. Our natural tendencies may be to be humble and expect the fruits of our labor to be recognized in due time. However, what we learned is that we are in charge of directing our career and thus as professionals need to toot our own horns. It is not necessarily about working hard, sitting back and waiting for recognition but more about performing at your role, articulating your accomplishments, and creating the important interpersonal relationships. However, what we learned is that we are in charge of directing our careers and thus as professionals need to toot our own horns in ways that work for us in our respective vocations, without compromising who we are. After the event, a half dozen of us scurried over to a nearby Korean restaurant. It was an awesome event where I was able to bond with some very experienced women, including Janice Won and Jane Hyun. I couldn’t say it better than Julie, a new AWLN member, who got a phone call and told her friend “I’m having dinner with the author!” How many people could say that? Emily Chiu is the Chair of Professional Development for AWLN. If you would like to be an active member to assist in brainstorming events, hammering down logistics, planning events, or building such skills, get in touch with her. Please send questions or comments to: Emily@alumni.cmu.edu with Subject AWLN. WOC are a diverse group of Asian, Black, Hispanic and Native American women. There are differences among us - but we achieve more when we support each other. Build your Board of Directors. We need to tap a diverse group of mentors (including white men) for career guidance and support. As our careers advance, Board composition may also change. Be prepared to take a detour. When we’re certain about career goals but encounter roadblocks, we should consult our Board of Directors for ways to sidestep the obstacle. Balance career with family and community. We draw energy from our families and from the work we do in our communities. Maintain those commitments! As our careers grow, we should build steps others can climb. Junior colleagues -- and our own children -- rely on us to make progress for the larger WOC community. For more detail on the conference, go to http://www.spelmanwomenofcolorconf.com/registration/index.html. Save the date for next year’s conference on May 10 and 11, 2006 titled “Building Bridges”. You won’t want to miss it!